While in Mannheim, in late 1777, Mozart first heard the Clarinet. This was during his ill-fated trip to Paris (1777-1778), the purpose of which was to try to secure a position anywhere in Europe other than Salzburg, where he felt his talents were wasted. Not only did he not receive any offers for a position, his mother died while they were staying in Paris in 1778. 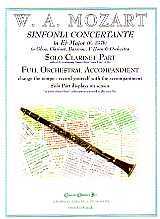 Sinfonia Concertante was written in April 1778, while in Paris - the same time as his Concerto for Flute and Harp (K. 299). K. 297b was originally for Flute, Oboe, Bassoon, F Horn and Orchestra but the score, which was left in Paris, disappeared. Mozart re-wrote the score in its present form, replacing the Flute with Clarinet. In addition to the regular display smp files, an extra ensemble version of each smp file (the file names begin with “X”) has also been included. In the ensemble versions no solo part displays on screen, but any part can be played or muted in Controls/Accompaniment Options.